No one wants to clean their grout and tile by hand – it’s hard work! Simply scrubbing your floors with soapy water cannot break up the dirt that has been building up for months at a time, and the scrubbing itself will hurt your back! Let JH Cleaning take one more job off your hands (and knees) with a powerful, yet safe and gentle, cleaning process. 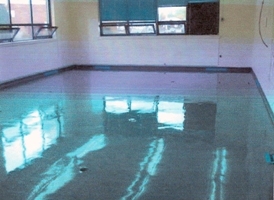 We will restore your floor's original state by carefully dissolving dirt and grime. 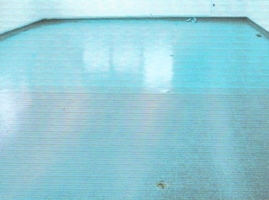 Using a specially developed tile and grout cleaning solution and high-pressure, hot water rinse with a fully enclosed vacuum system, JH Cleaning can restore clean to all your ceramic tiles and grout. Whether you’re concerned about your bathroom floors, showers, bathtubs, kitchen floors, tiled foyers, entryways, tiled halls, sunrooms and countertops, we’re here to help! We offer the latest in cleaning technology: a patented pressurized hot water extraction system. 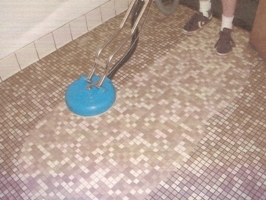 First, we apply a specially designed soil-releasing solution to your tile and grout. This breaks up any dirt that could be built up inside your floors, making it easier to be removed. Next, we clean your tile and grout with our 220 degrees hot water extraction system. This pulls out the broken up dirt and buildup with results that no ordinary cleaning methods can achieve. We finish off the cleaning process with a rising agent, which eliminates the sticky residue commonly left behind by household cleaners. We only use the best products for our clients, never settling for cheap solutions. When you choose JH Cleaning, you can rest assured that you’ll get the best shine that lasts a long time! Your tile floors, countertops, bathrooms and more are what makes your home special – don’t let them lose their shine over time! Cleaning your tile and grout improperly can seem like a small thing in the grand scheme of things, but the reality is that you could be causing permanent damage. Buying cleaning solutions from the local convenience store is far from "conveniencing" yourself when you’re hurting your tile in the long run. These products are also rarely eco-friendly or even safe for your family to be around. At JH Cleaning, we use gentle cleaning solutions sprayed at high temperatures to safely buff away years of built-up grime. We have extensive knowledge of tile cleaning techniques and are easily able to bring your stone back to life! Contact the professionals at JH Cleaning today to request our tile and grout cleaning services!